... that I ate this last night. It's a Belgian Waffle from Starbucks. 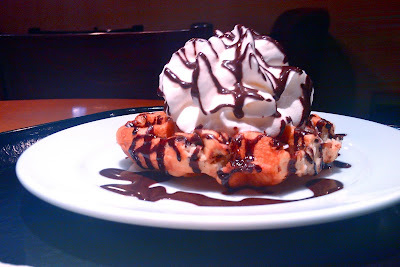 Heavenly treat - with sugar bits in the waffle and whipped cream and chocolate dressing on top. I beg you not to tell my trainer. If he finds out, he'll make me do 100 push ups on our next personal training session.